Produktinformationen "JR Propo Servo DS189HV 6V/7.4V 0.2/0.16sec/60° 3.5/4.3kgcm 2BB MG"
* If used on a large control surface - typically aileron, rudder, elevator or flap on an airplane, Digital servos (DS · MP · MPH series) may move slightly around center while on the ground. This is an expected phenomenon, and will not occur in the air. 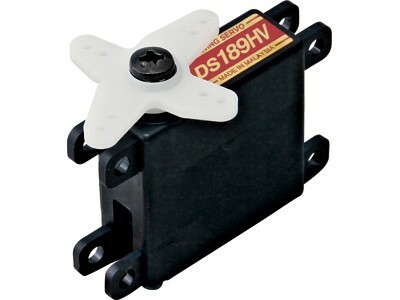 Weiterführende Links zu "JR Propo Servo DS189HV 6V/7.4V 0.2/0.16sec/60° 3.5/4.3kgcm 2BB MG"
Kundenbewertungen für "JR Propo Servo DS189HV 6V/7.4V 0.2/0.16sec/60° 3.5/4.3kgcm 2BB MG"